City Hall of Balfast — Belfast City Hall is a neo-Renaissance monolith of Portland stone pillars, pediments and parapets. The building's facade is rigidly symmetrical and the interior is of Italian marble and oak panelling. "Belfast's booming," my Northern Ireland friends tell me before my journey back to the place of my birth. They would say that, wouldn't they? It's only natural to be biased and proud of where you live. Unfortunately, I didn't have pleasant memories of the city. At the height of "The Troubles" I spent a fearful year, teaching in a large secondary school. In those days Belfast resembled a steel fortress, with tourists about as common as asbestos candles. The subsequent 30 years of civil unrest did little to reassure me a visit to the city would prove an enjoyable experience. How wrong I am! This is no bombsite. Not a soldier in sight. Gone are the fear, confrontation and tension I remember. Here is a city, vibrant, affluent and sophisticated. A city regenerated, whose freshness, optimism, and dare I say it, beauty, are a revelation. My friends are right — Belfast is "hiving." With the disappearance of the troops and the former mayhem seemingly receding into the Celtic mist, the city throbs with a new enthusiasm. 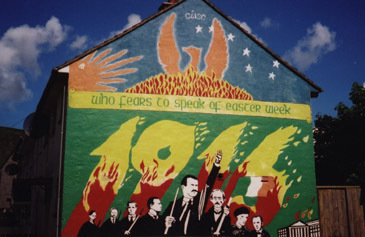 Images of the past, such as the murals painted during "The Troubles" are now major tourist attractions. Previously I would never have ventured up the Falls or Shankill Roads, but here I am strolling about in the former "no-go" areas appreciating aspects of Northern Ireland's cultural diversity so vividly portrayed on the gable walls of the small terrace houses. While on the Falls I meet a class of primary school children viewing the murals as a practical educational experience of the area's legacy. Continuing down the Falls Road, I pause for coffee in the Culturlann Arts Centre. Here the Irish language and heritage are celebrated through live performance, with a wide range of books and souvenirs on offer. It's good to hear Irish being spoken, and although the menu is in Gaelic, ordering suitable refreshments is not a problem. Next stop, the Fernhill Museum on the Glencairn Road, where the social history of the Shankill district is so colourfully displayed. Here is a poignant demonstration told in the words of those who lived, loved, worked and played in the area. Faithfully maintained, and focusing on the "loyalist" (Protestant) tradition, Fernhill provides a revealing insight into the industrial development of a city previously world famous for the manufacture of ships, aircraft and linen. 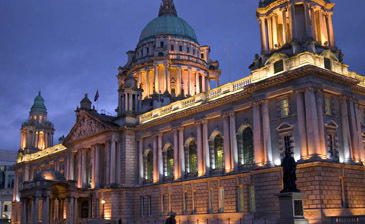 Built in white Portland stone and regarded as one of the finest classical renaissance buildings in Europe, the City Hall dominates downtown Belfast. Inside, with its cupola rising 173 feet (52 metres) above the Italian marble entrance hall, I am reminded of the Capitol Building in Washington. Guided tours of the City Hall are free and include the banqueting hall, council chamber and reception rooms. Some of the oak panelling, marble work and carpeting are quite stunning. I recall meals in Belfast as very much a mono-cultural experience. When the "Ulster fry" (bacon, eggs, fried bread, black pudding and sausages) — that heart attack on a plate — was the staple dish. Not any more! Along the "golden mile" stretching up Great Victoria Street to Donegall Square, are restaurants, cafes and bistros to suit every palate and purse. I am told that there are in excess of 450 eateries in the city catering to Mongolian, Italian, Kosher, Mexican, Thai, Mediterranean, and new Irish tastes. For an emigrant like myself, the lure of traditional Irish fare proves too strong and I opt for the "Crown Liquor Saloon." 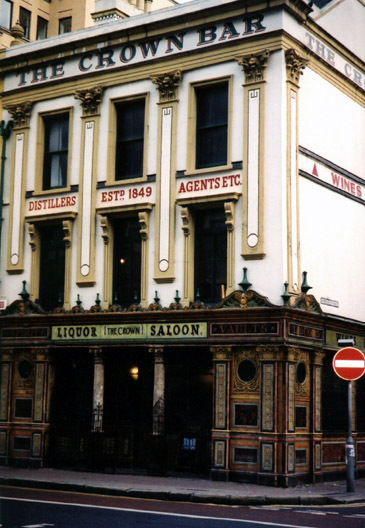 "The Crown," is Belfast's most famous pub, and is certainly not one of those ubiquitous "Oirish theme bars." The only theme is drinking and eating — this is the real thing. Carefully restored and preserved by the National Trust, it exudes all the atmosphere and elegance of Victorian times with its scalloped gaslights, gleaming brass work and wood-panelled private snugs, reminiscent of church confessional boxes. Ignoring my cardiologist's advice, I order half a dozen Strangford oysters, a plate of champ (creamed mashed potatoes, butter and spring onions) and wash the lot down with a welcoming pot of Guinness. 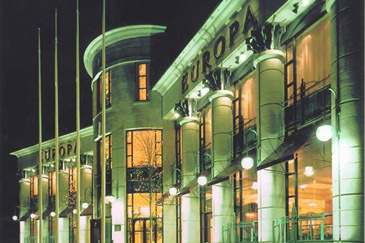 Just opposite "The Crown" is the Europa, a modern, elegant, popular, four-star hotel. At the height of "the troubles" it was known as the most bombed hotel in Europe, a sobriquet long since cheerfully relinquished in favour of Sarajevo's Holiday Inn. When I lived in Belfast, the Europa was my weathervane, a powerful symbol of survival and fortitude during the difficult days of the 1970s. No matter how many times the hotel was bombed (and the staff stopped counting at 30), it got right back up again, and stubbornly refused to close in the face of fierce intimidation and social unrest. 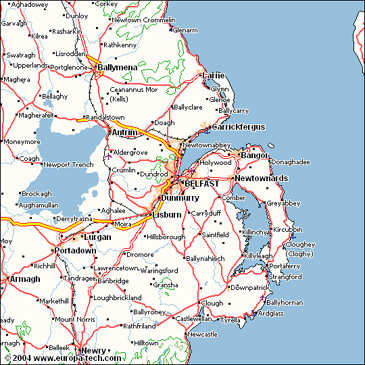 It now reflects the economic resurgence and increasing confidence of a prosperous and peaceful Northern Ireland, and boasts occupancy rates of more than 90 percent. I am pleased to be back again in its comfortable and friendly surroundings. While Belfast's past is carefully preserved and displayed in places such as the Ulster Museum and the Linen Hall Library, the city is building for the future. New hotels, theatres, arts and sports venues, nightclubs, restaurants, multiplexes and an IMAX cinema have been constructed. 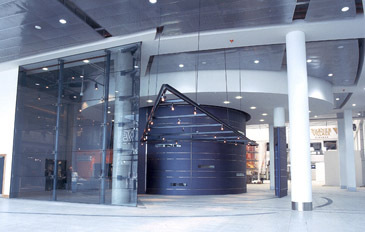 The extensive Odyssey Centre overlooking the River Lagan, contains an extensive "interactive science and discovery centre" featuring a staggering array of weird and wonderful machines and exhibits. Had I been exposed to something like this in my youth, physics might not have seemed so incomprehensible or boring. 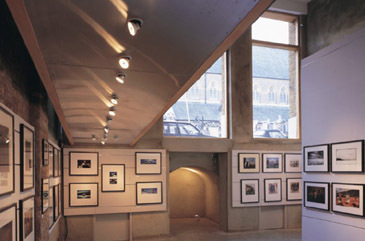 The new Laganside Centre is endowed with an array of cafes, performance venues, restaurants and art galleries. The curfews and caution which marked the city for nearly three decades, inhibiting nightlife, has disappeared. I marvel at the current extensive range of late-night bars and cabarets, patronised by both locals and tourists, and regret that the "entertainment scene" was not so diverse or vibrant during my time in the city. Shopping isn't an activity I find inherently satisfying. 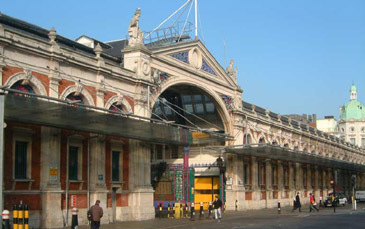 While all the leading retailers have outlets in Belfast, I prefer to browse around the "Aladdin's cave" of Smithfield Market, with its mix of second-hand shops selling books, jewellery, ornaments and general bric-a-brac. Good bargains and banter abound. One of the pleasing things about city is that I'm not assailed by a plethora of tacky craft and souvenir shops along every street. Belfast is not a place for the "in your face paddywhackery" which is such an inherent part of the Dublin scene, where the souvenir shops tend to aggressively peddle pseudo-Irish culture. Arguably the Dublin philosophy is here come the tourists, let's do the Irish thing. Belfast folk are seemingly more genuine and friendly. While it is possible to visit all, the tourist sites around central Belfast on one of the many guided tours on offer, it's also feasible, and perhaps more satisfying, to take a self-directed walking trip using a map from the Tourist Office. It's a great place to take "a wee dander," as the locals would say, for Belfast is a very walkable city with almost a village feel to it. Belfast Castle — The imposing structure of Belfast Castle towers over the city below. 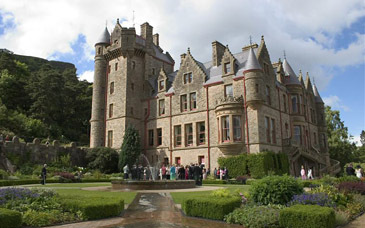 Situated on Cave Hill, the castle is closely linked with the history of Belfast City. The once oppressive and uneasy atmosphere of the city, where I formerly lived and taught, is gone. I feel no fear, nor am I in any way inhibited as to where I go. Belfast has shed its image of violence, and many thousands of tourists are now revelling in the transformation. The Crown Bar is only one of 12 hostelries on the historic guided pub tour of Belfast. Other famous bars include Whites Tavern, founded in 1630, The Kitchen Bar, noted for its traditional music sessions, The Duke of York, with its historic wooden snugs and the Morning Star — winner of the British Airways award for "best pub food." 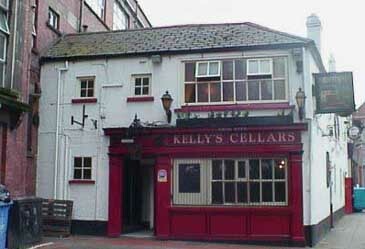 Kelly's Cellars, dating from 1720 (and perhaps the oldest pub still functioning in Ireland) was used by the United Irishmen in planning the 1798 rebellion, while Bittles Bar features portraits of some of Ireland's most celebrated literary figures. These escorted walking tours, focused around the city centre, take about two hours, and usually involve visits to six pubs. The cost is 7 pounds stg. excluding your drinks!